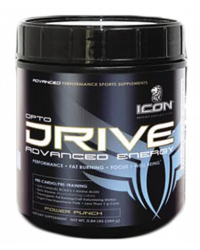 ICON SHREDS PM is the most advanced, stimulant-free fat shredder in its class. Its ultimate pre-workout matrix dramatically increases stamina and strength while sharpening your cognitive functions so you can achieve your desired shredded physique. The powerful rush you feel is the result of carefully and scientifically formulated ingredients that will effectively intensify your workouts. Our matrix contains safe, proven ingredients but leaves out any stimulants and caffeine, so you can push yourself longer and harder at any time of the day. Utilize the natural energy from the B complex to enhance your mood and stimulate your immune system. 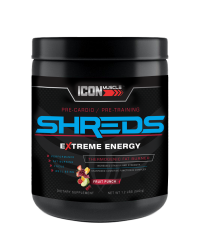 GET SHREDDED WITH ICON SHREDS PM! Raspberry Ketones, CLA, Citrus Aruntum, Guggul, Evodia Rutae Carpa, Forskolin, Sesamin, Cayenne Pepper: These powerful ingredients are combined to get your mind and body ready to focus. Acetyl-L-Carnitine, Acetyl-L-Tyrosine, Betaine, Insitol, Bacopa Monniera, 5HTP: These building blocks of proteins work together with the power of 5HTP, a product L-tryptophan to combat depression, anxiety, headaches and more. Combining these amino acids with D-AA supports metabolism as well as testosterone levels. HMB reduces muscle protein breakdown. These essential nutrients convert your food into fuel, giving you natural energy that lasts all day while enhancing your mood and stimulating your immune system.